We got to see Beck last night at Davies Symphony Hall. Best date night ever! First, some background. Pop-Up Magazine is a magazine that is performed live with segments that follow a typical magazine layout: food, culture, history, sports, travel, fashion, profiles, advertisements, etc. It is intentionally not recorded and not photographed, meaning the attendees are seeing an event that will play out only once and will never be seen again. The concept is brilliant. 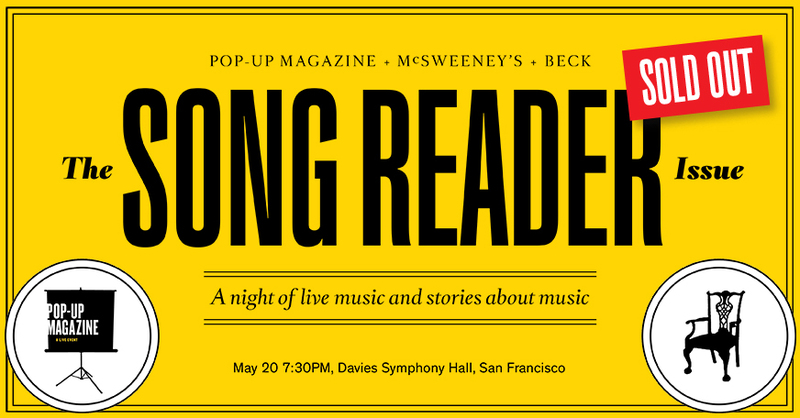 They’ve had 8 issues so far, with last night a special Song Reader issue featuring Beck and his music. I’m not even a big Beck fan, yet I was still totally amazed by the show. Actor John C. Reilly sang with his musical group! Kronos Quartet and the Green Street Mortuary Band played. Someone did an investigative piece on anechoic chambers, featured in the Guinness Book of World Records for being the quietest place on earth. So quiet that you can hear your own heart beating or your blood coursing through your body. These soundless rooms are used to commercially test the decibel level of products. Ledisi, a Grammy-nominated singer I’ve never heard of, shined. Hearing this great show made me realize I need to branch out and listen to more music. There so much out there I don’t even know about. Feel free to share your favorites in the comments.